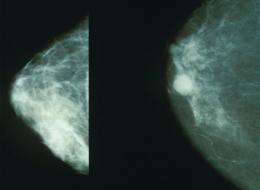 Mammograms showing a normal breast (left) and a cancerous breast (right). Credit: Wikipedia. Women with a specific gene mutation have a higher risk of dying from a type of breast cancer, said a study Tuesday that raised prospects of targeted drugs. Previous research had shown that the chances of surviving breast cancer after treatment were partly inherited. It was suspected that genes in the body's immune system were involved, but it was unclear which ones. Now scientists link a variant in CCL20—a gene involved in immune response—to a higher risk of death for women who have undergone chemotherapy for so-called oestrogen receptor negative (ER-) cancer. The discovery "can represent ideal targets for tailored therapeutics, and may also enhance our current prognostic prediction capabilities," said the results published in the journal Nature Communications. 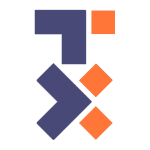 The team used data from numerous studies involving more than 2,600 women in different countries. They looked at protein-coding changes in genes among women who had received chemotherapy for ER- cancer, a category that affects a minority of patients and is harder to treat than ER+ cancer. The team adjusted the results for possibly confounding traits like a patient's age at diagnosis and tumour size. The discovery explained only a small fraction of the variation associated with breast cancer survival, and more mutations must be uncovered to fully understand the genetic basis of ER- prognosis, wrote the researchers. In a separate breast cancer study published online by the British Medical Journal (BMJ), researchers from Norway and the United States found that mammograms carried out once every two years may reduce death risk by about 28 percent. About 27 deaths from breast cancer can be avoided for every 10,000 women who did mammography screening—or about one in 368, said the team after analysing data from all women in Norway aged 50 to 79 between 1986 and 2009. "Breast cancer deaths occurred in 1,175 of the women invited to mammography screening and in 8,996 of the women who were not," the team wrote, calling the link "substantial". The finding adds to the ongoing debate about the value of such scans versus the dangers of overdiagnosis, which sees some women undergo invasive treatment for cancers that would never have made them ill or even been found without a mammogram. In a comment also carried by bmj.com, two American professors of medicine, Joann Elmore and Russell Harris, said the team had by no means put the issue to bed. "The Norwegian study largely confirms what is already known: the benefits of screening mammography are modest at best," the pair wrote. "While the benefits are small, the harms of screening are real and include overdiagnosis, psychological stress, and exorbitant healthcare costs."